12.5" Overall with an 8" sharpened, hand forged damascus steel blade. Full tang with highly polished brass and hardwood handles. 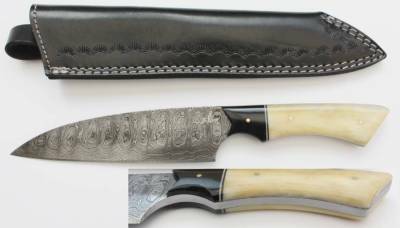 Stunning item, we've incorporated some great features into the knives such as reducing the weight in the blade by shaving the spine and improving the feel of the knife in the hand, the results are an impressive kitchen knife.